If you have enjoyed the physical and mental relaxation of a hot stone massage, then you may understand how this ancient therapy can go beyond muscle pain relief. It is the type of therapy recommended to assist in stress relief management, but it also can promote joint health and possibly prevent some health conditions. We will take a detailed look at hot stone massage therapy and how to give a hot stone massage to your partner and even to yourself. So, what is hot stone massage therapy? It seems like everyone is talking about it lately, giving the illusion that it’s a fairly new therapy technique. It is actually one of the first therapeutic methods as the hot stone massage origins date back thousands of years. Though we may not have any solid documentation before the last century to support this idea, experts believe the Native Americans were the first to use this form of therapy. Stone and rocks were heated in an open fire before being wrapped and placed on the part of the body afflicted with an ailment for healing. This is why many hot stone massage therapists have incorporated spirituality into the sessions. Therapists have used the same techniques, and developed some new ones, to understand the proper positioning of the stones on the body to target specific discomforts and diseases. Let’s learn how the stones are used to work with the tissues and nerves to treat the body and promote good health and joint pain relief, along with stress relief. During a hot stone massage, you will notice the rocks used are not the same everyday rocks you find on the sidewalk. The stones for hot stone massage are selected for their temperature abilities, physical stature, and mineral components. These properties, as well as the stones’ placement on the body, are essential to a successful treatment. One of the more commonly used therapeutic stones is the basalt stone from the igneous rock family. Created by a volcano’s lava, once hardened, this type of stone will turn a shade of green, black, or gray depending on the exposure to the elements. The basalt stones used are usually flat and smooth for better positioning. They also hold heat for a long time. Other popular stones for massage therapy include marine, limestone, or sandstone—all part of the sedimentary rock group. Their mineral qualities and ability to hold heat combine with their smoothness for a great pick. The marine stones are composed of coral and plant matter from the ocean. There is much more to a hot stone massage than collecting a bunch of smooth, flat rocks and placing them all over your body once they have been heated. It takes understanding the types of rocks and their mineral qualities to be able to match them in accordance to the proper ailments. You also must understand how diseases, disorders, and pain can relate to the body and organs. For example, the rocks placed on the back would possess different internal qualities than the stone placed on the arms or legs. A therapist may use several different forms of stones during one massage session. Most of today’s therapy sessions see the stones dipped in water before heating with the appropriate equipment such as a thermos-regulated electronic machine. It is critical not to overheat the stones to prevent burns to the skin and not to underheat as a cold stone massage targets different ailments than the intended targets. Your hot stone massage may begin with a oil massage by hand before placing the stones. By placing the stones directly on the body, the heat can be focused deeply into the tightened muscles and tissue. A thin cloth can also be placed between the client and the stones if requested. There are home massage kits available to purchase with detailed steps and many include the same type of stones professional massage therapists use. Once you are ready to begin, remember to ensure the stones are not too hot by handling them with your bare hands. Avoid placing stones on the face and scalp as these areas are thin and burn easily. Step One – Clean the stones in a basin of water with three to four drops of an antibacterial soap. Rinse. Step Two – Place stones flat on the bottom of a deep saucepan or slow cooker and enough water to fill the dish. Step Three – Heat on low to warm stones for 30 minutes. Do not overheat as stones hotter than 125° F can burn skin. Step Four – Your partner should lie face down on a bed or table with little to no clothing. Use a sheet for privacy and to avoid chill. Step Five – Start by placing stones on the left leg at the top, center of thigh, back of knee, and on the calf. Leave while you massage the right leg with added pressure. You can use oil if you wish. Step Six – Taking the largest stone from the left leg, slowly place on the skin at the heel and slide it up the right leg to just below the buttocks. Step Seven – Place warm stones on the right leg in the same spots as the left and allow them to sit while you massage the left leg. Take the largest stone from the right and slide along the left leg up to the buttocks. Step Eight – Place a large stone on either side of the buttocks for a few minutes before massaging the muscles. Step Nine – Place warmed stones on your partner’s neck, shoulders, and lower back for two to three minutes. Next massage each large back muscle. Step Ten – Repeat all massage steps on your partner’s front body side. There are many physical, mental, and emotional-based benefits to having a hot stone massage performed. We will touch on the five most common hot stone massage benefits. Contrary to beliefs that the heat from the stones may give discomfort, the warmed stones can provide pain relief for aching and damaged muscles and tissue. The pain from conditions such as fibromyalgia and rheumatoid arthritis may be alleviated with this massage technique. By lessening the pain, a patient may have a better range of motion with affected muscles and joints. 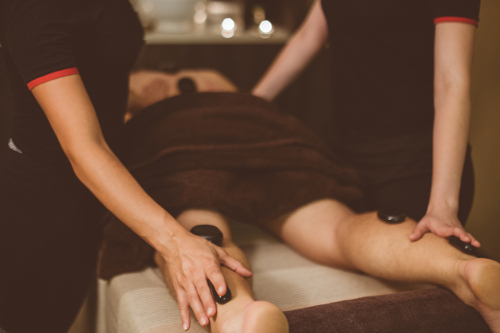 The physical touch of a massage combined with the gentle application of heat may attribute to alleviating stress, both physically and mentally. The atmosphere usually created by a therapist can be a quiet and peaceful, not to mention in a darkening room in most cases. This can help with anxiety while promoting good cardiovascular health. A hot stone massage may help improve your joint flexibility by relaxing the muscles. This could alleviate the associated joint pain as well. The heat from the stones in combination with the massaging of the muscles and tissue can treat spasms and loosen knots. Inflammation is alleviated and the reduced tension will result in less pain. We know that experts recommend a good seven to eight hours of sound, peaceful sleep each night. The daily worries, stresses, and physical pain can cause insomnia and result in more muscle tension. A correctly performed hot stone massage may treat all of the issues that arise with a lack of proper sleep. It is important to note that while a hot stone massage may appear to be beneficial for many common ailments, diseases, and disorders, there are risks to consider. Because of the heating element of the stones and the massaging motions, there are certain people that may not qualify for such a massage. This can include someone with open wounds, sunburn, viral infections such as a cold or flu, certain heart conditions, severe diabetes, pregnancy, or anyone under the influence of alcohol or drugs. A hot stone massage is one of the most relaxing treatments many enjoy from time to time. This form of massage can promote good health and possibly treat issues arising from some conditions. It can be a helpful tool in treating and promoting improved physical, mental, and emotional health of most people. Those at risk for developing complications should discuss their health condition with the therapist before starting any form of massage. If you are comfortable enough, you can follow the steps in providing a hot stone massage at home. “What Is Hot Stone Massage, How It Works And Its Benefits,” Massage Therapy Schools Information; http://www.massagetherapyschoolsinformation.com/hot-stone-massage/, last accessed May 29, 2017. Crawley, L., “What Types of Stones Are Used for A Stone Massage?” Leaf; https://www.leaf.tv/articles/what-types-of-stones-are-used-for-a-stone-massage/, last accessed May 29, 2017.